The start to any school year, for any classroom, can be tough. 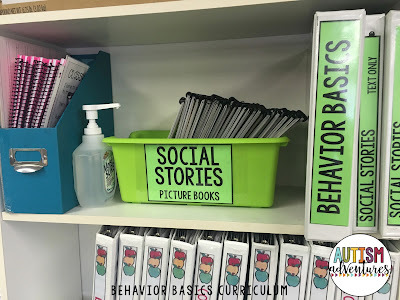 There are so many demands put on staff including baseline data, compliance deadlines, district benchmarks, insturction, IEP goals and of course behavior management. It is crucial to set expectations and guidelines for students from DAY 1 so that they know what is expected of them. I start with 5 simple rules for the kids. These 5 are the "staples" to my classroom. Of course there are a "million" rules and expectations, but I don't like to bombard them with too many upfront. So how do I introduce these rules to my class? I start with a social story. 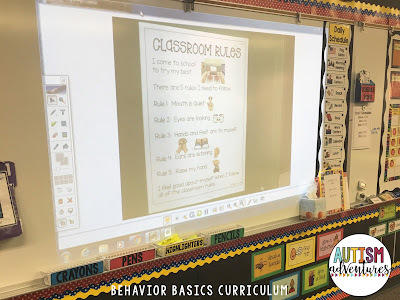 On the first day of school I projected my social story about the rules on the smart board to create an interactive reading activity for the students. 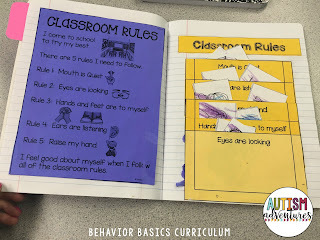 Students helped read the story and we broke down each rule. We modeled, we changed and we interacted. Students took turns coming to the front of the room to help circle certain words, underline key points and model for their peers. It's important to keep them engaged during an activity like this! 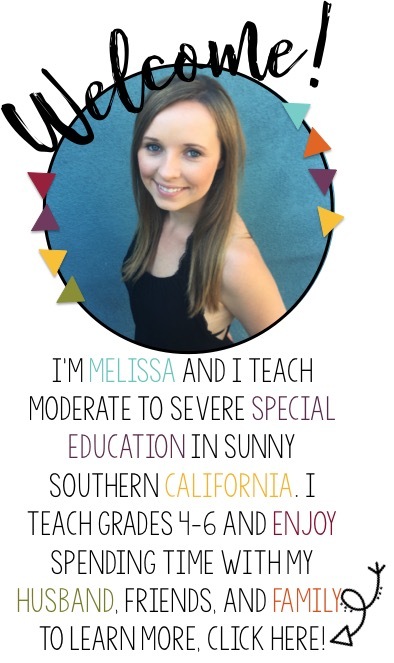 Every student loves a chance to "play teacher" so this is a perfect opportunity! 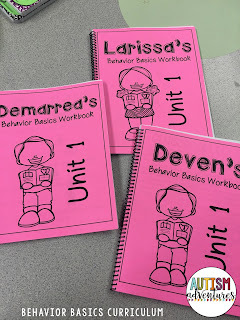 Students can also have a copy in front of them for reference. Following the whole class read aloud students broke into small groups to read their "leveled" text. I have 3 levels that allow for easy differentiation. The highest level has all text, the middle level was the one I projected with text and pictures and the lowest text is a laminated book that has one sentence/picture per page. 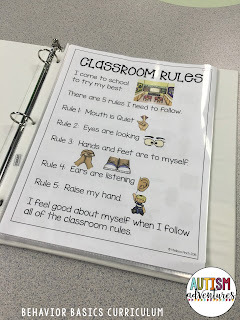 I discussed the classroom rules over the course of the entire week. Every day we reviewed our social story for a quick refresher. On Tuesday we had a lot of fun with a whole group discussion. 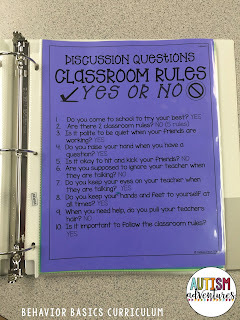 I used these 10 yes/no discussion questions to guide my discussion. I had a few "characters" in my class that led to further and further discussion as they led me that way! I used these simple yes/no participation sticks for students to be able to maintain engagement and answer the questions. 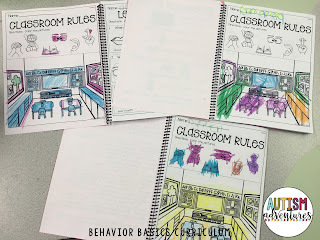 Students also got an opportunity to color a picture in their behavior basics workbook to reinforce the concept of the classroom rules. While it may be a simple "coloring page" I am sure to discuss each item while we color it. 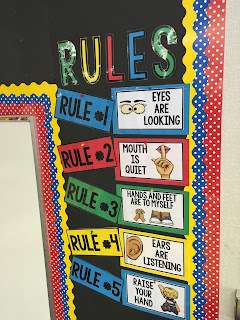 This is a great way to discuss the rules in an informal way without the students being aware that they are working. 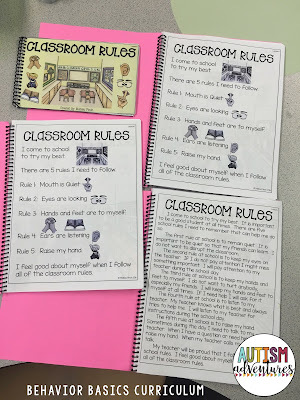 On Wednesday we dug deeper into the classroom rules and completed an interactive notebook page. This will be a great reference throughout the year when certain behaviors need to be reviewed as incidences come up! 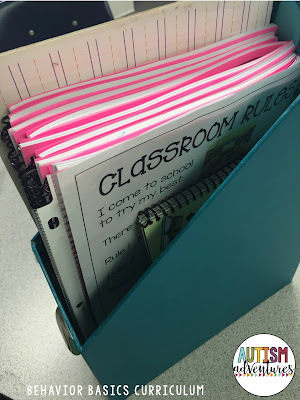 Since this was our first attempt at an interactive notebook in my class I had all the pieces pre-cut so that it was not too overwhelming. 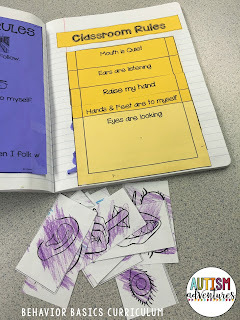 Students colored pictures and sorted them into the pocket interactive notebook activity. 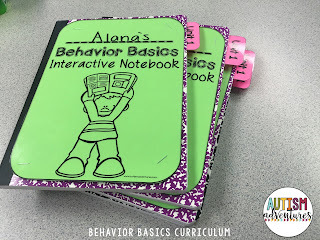 They also glued a smaller version of the social story into their interactive notebook. I have them glue it in so that it can be used as a reference for years to come at home if their parents need it! 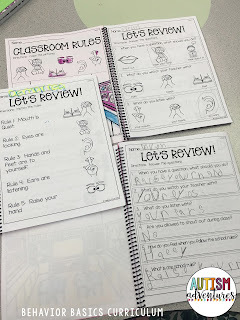 To end the week we completed our assessment pages to see how the students learned their classroom rules. As you can see I have 3 different levels of assessment depending on my students ability. There is a matching activity, multiple choice questions or simple Q &A. This allows me to challenge my kids while still working on the same content. 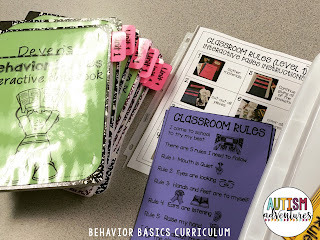 I love to extend important skills such as classroom rules through books and read aloud. These are two great books I found that were fun to read with the students. 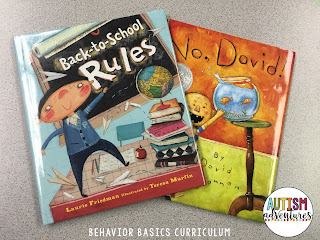 Both of these books allowed for deeper thinking about classroom rules and to build further discussions. 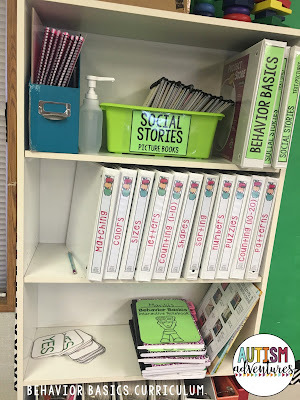 I store all of my behavior materials on the same shelf so that we can pull a social story at a moments notice to review these necessary skills. 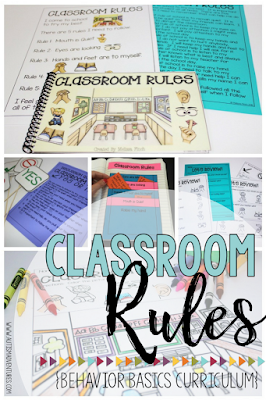 Are you looking to teach classroom rules in your class? 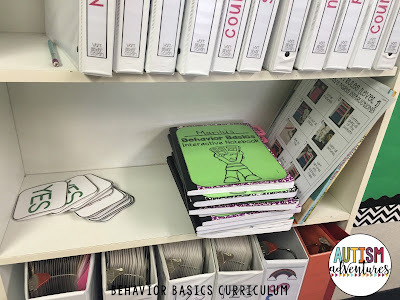 Grab Lesson 1 of my Behavior Basics Curriculum HERE.